Throughout the 10+ years that I’ve known this episode’s guest, Joe Rajacic, he never ceases to inspire or amaze me. Joe tells us how, at 10 years old, when he watched Alan Shepard on TV (the first American to fly in space), he knew exactly what he wanted to do when he grew up. A sponge for everything aviation, Joe tried to get into the U.S. Air Force but was turned down due to the surplus of pilots from the Vietnam era. He figured that someday the airlines would fly in space, so he decided to do the next best thing: he became a commercial airline pilot for United. For a brief time, United ran a space program where Joe learned all about space flight, but it ended after the Challenger disaster pushed United to pull the plug on its program. Joe still enjoyed 22 years of flying a 747 and being able to explore cities all over the world. After retiring, Joe founded a non-profit called ALEX (Aerospace Learning EXperience). 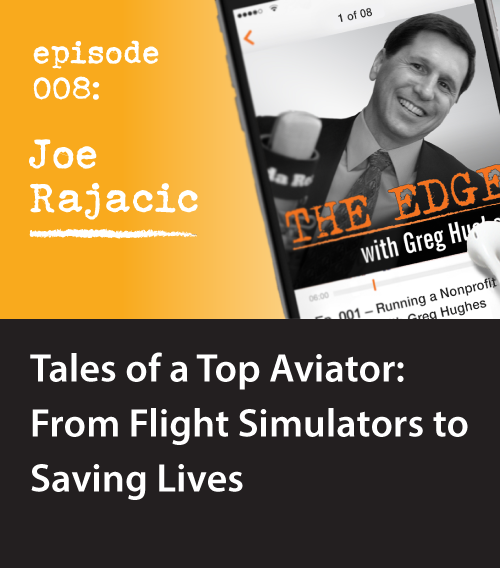 Using flight and drone simulators, Joe teaches specialized classes to pilots in training. He also uses the flight simulator to expose young people to the joys of aviation and to help people get over their fear of flying by showing them how a plane works. In addition to his work at ALEX, Joe pilots a Citation Jet (a Cessna light business jet) that can be hired out for personal use for things like flying to a remote fishing spot. He also flies for a medical group that harvests donor organs. By transporting boxes of hearts and lungs for recipients in need, Joe helps to save countless lives every year! Since Joe is a Hughes Capital investor, we also talk about how he used his Self-Directed IRA to invest in our fund Guardian. (Joe had a nice pension with United until they declared bankruptcy!) While Joe enjoys the ups and downs of flight, he’s not so thrilled about the stock market’s volatility, so Guardian helps keep his returns in a steady, upward flight pattern. * We apologize for the poor audio quality on this podcast. We make every effort to produce a professional-quality show, and have taken action to prevent this in the future. Joe flew with United Airlines for 37 years, retiring as a 747-400 Captain. He flew a multitude of aircraft – from J-3 Cubs to military jets, including Lear, Citation, DC10, 727, 737, and 747-400 with over 23,000 hours. 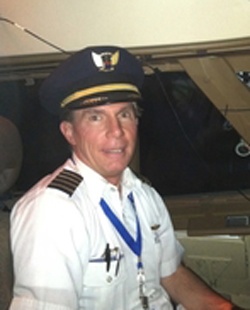 He is rated as a CFI-A, CFI-I simulator instructor, an A&P Mechanic, and a Flight Engineer. Joe has been a NASA special projects/simulator/research pilot on projects such as the Boeing SST prototype, sleep deprivation studies, and Future Flight Navigation programs. He was also a corporate pilot and production test pilot/design engineer. Credits include Project Manager/Chief Designer for lighting sub-systems on the Rockwell International Space Station Mockup. He was awarded F/O of the year in 2008 and was chosen as one of the Top 100 Employees at United Airlines for work at the United Airlines Training Center as a B747 Subject Matter Expert. Joe joined ASAP (the American Society of Aerospace Pilots) in 1980, first as a student and then as a coordinator and lead instructor in a space flight training program. He taught Basic Space Flight studies, including Orbital Mechanics, Space Navigation, and The Space Shuttle Launch Vehicle and Its Systems. Joe has been a consultant to various companies working on UAV (Unmanned Aerial Vehicle) Pilot training programs, and he is the director of ALEX (Aerospace Learning EXperience), a STEM education 501(C)3. Joe graduated with honors and a B.S. degree in Aviation/Management. Outside of aviation, Joe is also an avid car enthusiast in everything from classics, to hot rods, to muscle cars, to sports cars. He’s been a guest lecturer, corporate sponsor, and car show judge at the National Automobile Museum, The Harrah Collection. Joe restores Corvettes and has designed and built custom Harley-Davidson motorcycles. For 8 years, Joe has owned Classic Car Storage of Reno. Automatically download new episodes to your phone! Subscribe on iTunes (if you have an iPhone) or Google Play (if you have an Android) and the new episodes will automatically download to your phone as they are released. If you enjoyed The Edge, please rate us and leave a review.